Preheat oven to 400. Sprinkle 1 tsp garlic powder, salt, and ground thyme on one side of the Flounder. Put parchment paper in a pan. Place fish seasoned side up in the pan. Bake uncovered for 12-15 minutes. If using frozen garlic, melt the garlic squares over medium-high heat in a large skillet. If using fresh garlic, mince the garlic cloves, lightly PAM the large skillet, and cook garlic over medium-high heat for 1 minute. Remove the stems from the spinach and add leaves to the skillet one hand-full at a time. The spinach reduces significantly when it wilts. Cook until all leaves are wilted, about 10 minutes, stirring occasionally. Add the cream cheese to the wilted spinach and stir until melted. Remove from heat. Gently wash the mushrooms and remove the stems. Slice the caps into 1/4 inch wide slices. Add the mushrooms to a large skillet and season with 1 tsp garlic powder, salt, and ground thyme. Cook over medium heat until browned, about 7 minutes, stirring occasionally. Remove from heat and combine with the creamed spinach. Remove the flounder from the oven. Divide mushroom and spinach mixture into 3 separate plates. 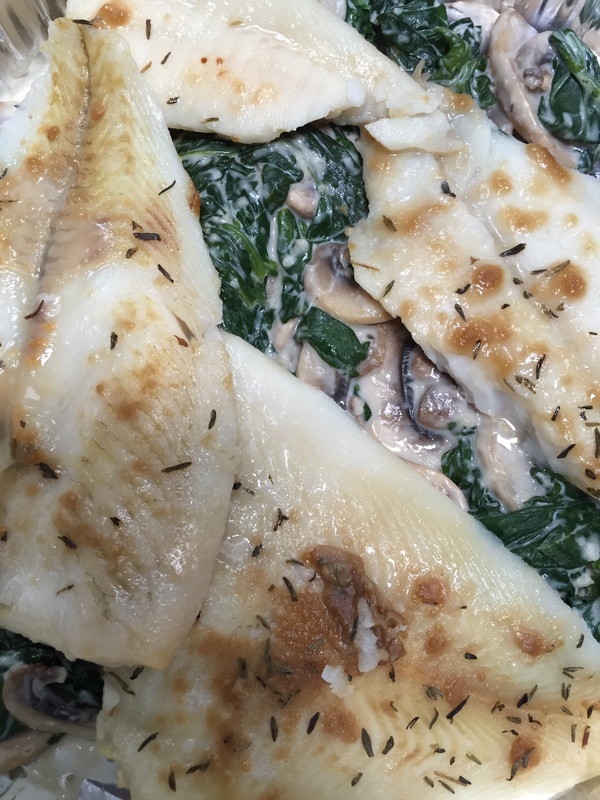 Cover the flounder with one slice of mozzarella. Cook another 12-3 minutes or until cheese is melted.